A new third-party software program has been developed that will allow poker players to see what, or who, is at fault for their losses: The Poker Luck Meter (PLM) was designed by computer programmers, who are also avid poker players to separate the luck from the skill in poker. An added benefit for users of the program may lie in ‘Tilt Control’. After all, when you are getting smooshed at the poker tables it’s nice to know that your opponent’s are just getting lucky. Conversely, it’s also nice to see how lucky you are sometimes! At the moment, only the Best Online Poker Sites, Party Poker, Full Tilt Poker, and PokerStars are the only three online poker rooms that support PLM’s software. 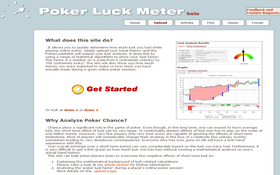 Additionally PLM only can measure the ‘luck vs. skill’ in Texas Holdem games. This entry was posted on Wednesday, August 25th, 2010 at 8:34 am and is filed under Poker Industry News. You can follow any responses to this entry through the RSS 2.0 feed. You can leave a response, or trackback from your own site.